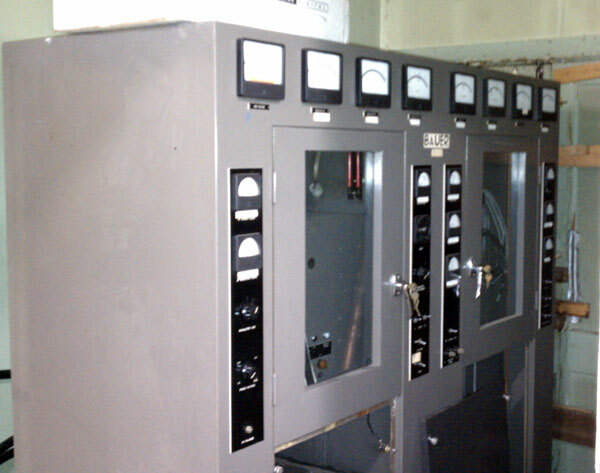 This is a Bauer FB-5000J transmitter, stashed away in the corner of a transmitter site. Sorry I can’t get a better angle on it, as I said, it is stuck in the corner. I don’t know what vintage it is, it seems to be from early 1960 or so as it has a low serial number. 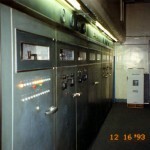 It ran as the main transmitter until the Harris Gates BC5H was installed in 1976. The transmitter is in beautiful shape, almost a museum piece. I don’t know if it still has all it’s original iron, as the modulation transformer may have contained PCBs and been disposed of. Otherwise, it is complete and tuned to 1,460 Khz. I think the owner might be willing to donate it to a reputable organization, preferably a 501(c)(3). An excellent transmitter with a fine sound. I have the one from 1390 in Chicago. A single 4CX5000A in the final PA modulated by a pair of 4-1000A Eimac tetrodes. Audio driven with the Hi-Fi developed EL34’s (6CA7). Excellent clean design from Fritz Bauer (FB) of California. I wouldn’t hesitate to run one of these yet today. Yeah, it would be a great transmitter to use, the thing is absolutely solid. If the mod transformer is missing, Peter W. Dahl can usually make one up without too much expense. It would be a great project to revive this thing and put it on the air. I remember when it was running, there was that sort of electrical ringing sound in the PA tank and tuning coils during heavy modulation. I love that sound. Is the modulation transformer missing? The original one in mine was an extremely beefy oil filled (askarel) unit and never gave any problems. The modulation reactor is also original in mine. In fact all transformers appear to be original. My FB5000J always had excellent talk power and sounded better than the MW5A that replaced it. When the DX-10 came, the MW5A became the standby, and the FB5000J had to go. My unit is brown, and may be earlier than yours. What brand panel meters does your Albany unit have? Mine are Phaostron which was a cheap meter and a couple have been replaced, and I believe yours are something else by looking at the picture. Also, your FB5000J looks to be a gray color. I will look at my serial number the next time I get over to my warehouse and see if I can get a date of manufacture. If I recall, it was around 1960. If you put that one back on the air, I believe it would interesting to get listener input as to how it sounds compared to most of the other “junque” out there on the air today. This transmitter is a sort of brownish grey, it may have had one side exposed to the sun for about 15 years as the transmitter room used to have large windows that faced southeast. During the late 90’s early 00’s the station changed hands about five times in as many years. One of those ownership changes, some banker somewhere decided they had to get rid of all the PCB’s, so the capacitors and transformers were removed from the transmitter and disposed of. The capacitors are probably pretty easy to replace, its the transformers that will be a problem, if some one wanted to return the transmitter to operation. The quality transformers that Fritz Bauer used were of much higher quality than Gates or even Collins used. I believe they were Thermador from LA. I have a spare modulation transformer for a Gates BC5P-2 but will have to check the load impedance of 4-1000A tubes compared to 3CX2500F3’s. I also have a spare plate transformer for a Gates BC5P-2, and I think the voltages were similar. As for the color of mine, it is dark brown very similar to the Nortel DMS100 CO switches and Nortel digital microwave cabinet racks. The only thing that I don’t like about the FB5000J is the cheap panel meters (Phasotron), since they can be problematic. As for the dufus who had the transformers pulled, this is typical of “desk types” who have no idea of the chemistry or total picture of the electric/electronics industry. We are interested in the FB Bauer 5000J transmitter or others that that could possibly be donated. I worked on a Bauer FB 5V. What a transmitter, very open easy to work on and the sound on the air was fantastic. This was the only transmitter that I worked on that would do 140 % positive without any clipping diodes or other tricks we used in the 70’s I would like to get my hands on a 5,000 watt Bauer again. I would probably use it as a main. The Fritz Bauer FB5V (named after his daughter Victoria), was his last 5kW transmitter, and introduced in 1968, before his retirement. The 5V was better than the FB5000J in that it was vastly improved, used 4CX5000A tubes throughout, and was more compact without losing serviceability. The audio was extremely robust with (2) 4CX5000A modulator tubes modulating a single 4CX5000A in the PA. Undoubtedly, one of the best 5 kW AM transmitters I have ever seen (and heard)! 1290 has one here as a standby since a “Gates 5” replaced it back in the late ’80’s. I have not seen any such quality in a 5 kW AM broadcast transmitter since. I’m calling from Greece and I would appreciate a schematic of that perfect transmitter FB-5000J the one with the 4-1000s as AF amp. Could you please provide me with that schematic? I will provide you my email address in this case. They would have it and might share. Otherwise, next time I am there, I’ll dig out the manual. It is the perfect transmitter, that is true. I see there has been some discussion of the Bauer 5000J. I am looking for a new home for one that was used in a major market and was on the air just a few months ago. It should be complete. Anyone interested should call me at 541-460-0249. Shame you are on the west coast, Ron. I’d take it otherwise. I have been interested in high fidelity AM for most of my life – now 78. This involves both transmitter and tuner design. I have just finished an AM tuner I have been working on for the last 30 years. It has an analog read out of average modulation – peak positive modulation with hold – peak negative modulation with hold. signal strength – incoming carrier frequency – modulation level warning lights. Outputs are: envelope detector – in-phase product detector, quadrature product detector , carrier phase modulation +- 5deg max. IF to CRO. – so there is not much I don’t know about the incoming signal. AGC is achieved with indirectly heated thermistors, so this generates no distortion. Fast AGC will attack low frequency modulation and cause distortion. In the “run” position the tuner will handle 100 % modulation at 10Hz no trouble. The tuner has a total bandwidth of 30KHz – 5th order maaximally flat. This can be reduced in steps down to 10KHz total. Would be interested to hear how things are in the US and swap a few ideas with you if that is OK.
Brian, thanks for your interesting comments. What you are doing sounds like a labor of love. I’ll shoot you an email off line. I do work for WSLW and we will be replacing an FB-5V soon. It’s mostly original and has been in operation since the early 70’s. I could use some advice right now on getting it back in operation. F1 keeps blowing and I can’t figure out why. Anyone that can help please email me at radiohitchhiker@gmail.com. This has been a treat! I have always loved high level plate modulated transmitters, and agree that they sound best on the air. I remember when 590AM here in Omaha put an RCA “Ampliphase” on the air in the early/mid 70’s…, did not sound like (as good as) the old RCA high level plate modulated critter. This model Bauer was in use at 1460 WWCN(ex-WOKO)Albany, NY when I did contract work there in the early 80’s. A beautiful rig. @Jim S, the transmitter pictured is the very one you used to work on. Hello All, My guess is this not one of the kits Bauer made ??? I have heard about them, but have never seen one !!! I wasn’t aware that Fritz made kits. you may end up learning alot about your transmitter. I did have a 10 minute phone chat with Paul Gregg years ago. from being destroyed… something that causes great distress in my heart. Knowing the outstanding engineering and quality performance is the obvious justification for going to these great lengths to keep these wonderful boxes in caring hands. I applaud all of the engineers here for sharing your wealth of knowledge and passion for the industry. Is the transmitter still available? I cannot find any information on the top row of 4 panel meters in the 707, other than they are Hoyt 2045s. Does anyone have any technical data? I think they are all 0-1 mA movements DC?? Mine are in terrible shape and need replacement. PS Videos of my Bauer are on Youtube. Phil…The original meters in my Bauer 707 were Assembly Products 561 on the top row. the vertical row are 361. I found exact replacements from LFE Meters (lfemeters.com). BTW, My Bauer s/n 120, is on the air everyday, and has been since new in 1961-62. It is a great little transmitter.